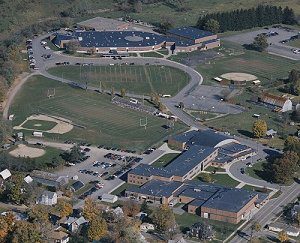 The Canton Area School District is located in Bradford, Lycoming and Tioga Counties in the northeastern section of the Commonwealth of Pennsylvania, with the Borough of Canton as the center of the district. The Borough of Canton is approximately 40 miles north of the city of Williamsport, Pennsylvania and 35 miles south of the city of Elmira, New York. The Canton Area School District includes the Borough of Canton and the Townships of Canton and LeRoy, in Bradford County; the Townships of McIntyre and McNett, in Lycoming County; and the Township of Union, in Tioga County. The School District has a total land area of approximately 206 square miles. A large portion of the area is rural in character, and for the most part consists of steep, wooded hillsides, spotted with narrow bottom-lands along the streams. It is part of the Appalachian Mountain region, and, as such, has some rich farm lands, well watered by the drainage from mountain slopes and streams. Major drainage of the area is eastward and southward by the Susquehanna River tributaries, and northward by means of the Tioga River tributaries. The governing body of the School District is a board of nine school directors who are elected on a staggered basis. The daily operations and management of the School District are carried out by the administrative staff of the School District headed by the Superintendent of Schools who is appointed by the Board of School Directors. State Routes 14, 154 and 414 traverse Canton Borough and Canton Township. The nearest scheduled airline service is located in Williamsport approximately 40 miles south of Canton Borough. An excellent transportation system makes all the markets readily available to those products and services that originate in the Lycoming County Area. An outstanding road network within the County has been an attraction to industry U.S. 15 (the Susquehanna Trail), is a major north-south route from Canada to Florida Interstate 80, (the Keystone Shortway), crosses central Pennsylvania and passes just 15 miles south of the city U.S. 220 and Interstate 180 are also important arteries through the area. Using this road network are nineteen long distance common carrier trucking operations. This excellent road network is used also by Susquehanna Trailways which provides highway passenger service to all major cities. Freight service is available in the area via Consolidated Rail Corporation. There are 830 miles of state-maintained highways and 1,097 miles of local roads within Tioga County. The most frequented highways are U.S. Route 6 (east/west) which crosses through Wellsboro Borough and U.S. Route 15 (north/south) which directly connects with Interstate 80 (east/west) to New York. Interstate 99 from Maryland to New York will pass through Tioga County and is scheduled for completion in 2007. It will connect to the Pennsylvania Turnpike, Interstate 80, and to US Route 17 to upstate New York. Commercial airport facilities are located in Elmira, New York, and in Williamsport, Pennsylvania, 60 miles from the County seat. A local authority-owned airport is located near Wellsboro Borough. Conrail provides railway transportation. Trucking facilities are available within the County for infrastructure and interstate trucking. Utility services for the area are provided by Frontier Communication, Pennsylvania Electric Company, and P.P.L. Gas Utilites. The Canton Water & Sewer Authority provides water and sewer services. Located in Bradford County are seven schools and one vocational-technical school serving approximately 17,000 students. Within commuting distance is Mansfield State University in Mansfield, Tioga County, Elmira College in Elmira, New York, Bloomsburg University in Bloomsburg, Pennsylvania and Keystone Junior College in LaPlume, Pennsylvania. Lycoming County has a number of institutions of higher learning. The Pennsylvania College of Technology was formerly known as the Williamsport Area Community College. Educational services are provided for both youth and adults of a post secondary basis, full-time and part-time, in the Liberal Arts and Sciences, Applied Arts and Sciences, and Continuing Education and the College has an enrollment of over 5,000. Penn College is Pennsylvanias premier technical college and an affiliate of The Pennsylvania State University. Lycoming College, a fully accredited four-year co-educational liberal arts and sciences college, related to the United Methodist Church, is located in Williamsport. It presently has 1,500 students enrolled. Among its many courses, Lycoming College offers a pre-engineering curriculum in cooperation with nearby engineering schools. The close working relationship between the College and the City makes it an important entity in Williamsport. Bucknell University is located 40 miles from the area in Lewisburg, Pennsylvania. Its curricula includes engineering, the arts and sciences, business administration, education, music, music education and graduate study. Bucknell is a private, co-educational University and has an enrollment of 3,550 undergraduate and graduate students. Pennsylvania State University, University Park, Pennsylvania, is located nearby. It has a resident student body of 41,445 and full-time faculty of approximately 2,870. Penn State ranks among the top ten research institutions throughout the United States; the total annual operating budget is in excess of $1 billion. Mansfield University of Pennsylvania, a component of Pennsylvanias State System of Higher Education, offers undergraduate, graduate and special courses. The University also provides cultural activities to the public. Plays, musicals and art exhibits can be enjoyed year round. The Mansfield University Festival Theatre sponsors plays performed by local performers and professional players from the New York Players Guild. The Mansfield University Planetarium also offers special shows to the public. The Penn College of Technology also provides further education to the County residents. Located within commuting distance of the School District is the main campus and north campus of Pennsylvania College of Technology. Elmira College located in New York State is also located within commuting distance of the School District. Lycoming County is a renowned outdoor sporting area with excellent areas for camping, hunting & fishing, hiking, skiing and snowmobiling. The County includes two state parks and portions of three Commonwealth forests are within the County. There are many historical homes, inns, farms and restaurants dispersed throughout the County. Several colleges in the area host many varied cultural events including plays, lectures, arts and crafts exhibits and numerous sporting events. Much of Tioga County is still forest. Its woods and streams offer excellent hunting and fishing. Located near Wellsboro, the County seat, is Pine Creek Gorge, one of the more popular scenic attractions in the eastern United States Pennsylvanias Grand Canyon. This 7,216 acre gorge, formed by Pine Creek between Ansonia and Blackwell, is 50 miles long and 1,000 feet deep. Tioga County has three major State Parks and three State Forest picnic areas. Its 1,360 acres of State Park land includes 137 acres of water surface and facilities for fishing, sunning, skiing, hunting and picnicking. The County has 150,056 acres of State Forest land, ranking 4th among Pennsylvania counties. Lakes, rivers and streams for warm and cold water fishing, swimming and rafting are widely available within the County. Tioga County is recognized to be one of the best areas in Eastern United States for both small and large game hunting. The Tioga-Hammond Dam, a project completed in 1979 by the U.S. Army Corps of Engineers at a cost of over $200 million, provides two separate lakes covering over 1,200 acres. The two recreation sites are used by the public for camping, swimming, fishing, picnicking and boating. Construction of the Cowanesque Dam, a flood control and recreation project of the U.S. Army Corps of Engineers, was completed in 1980 at a cost of over $100 million and provides a lake and two public recreation sites offering boating, swimming, camping, hunting, fishing and picnicking. The U.S. Army Corps of Engineers also developed the National Fishery Research and Development Laboratory for the U.S. Department of the Interior at Asaph. The Fish and Wildlife Service began operation of this facility in 1979. The vision of Canton Area School District is to instill in all students the desire to learn for a lifetime in a global society through quality instruction in skills, concepts, and experiences, which promote excellence in leadership, communication, and technology while valuing community roots.